This is my favorite obscure piece of computer hardware. If you're looking for an external hard drive to carry around with you for backups or anything else, I highly recommend this enclosure, especially for Mac users. A while back I went in search of an external drive enclosure that could connect to both Firewire 800 (for the fastest transfer rate to Macs), and USB 2.0 (for compatibility with all computers), and would accept a 2.5" SATA drive (which would allow it to be swapped into my laptop should I ever experience the tragic loss of my internal drive). This is the only one I found. It's very expensive as enclosures go, but as it's the only one that met my needs, I have found it to be well worth it. OWC makes a number of very similar enclosures, which you will see if you peruse their site, so you have to read the descriptions carefully to get the one you want. 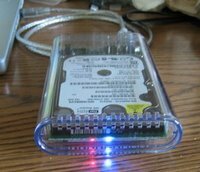 Note, this is only the enclosure, you have to buy the drive separately and install it yourself. If you're not the type who likes to tinker with computers, it's not really that hard, you just need to have a tiny precision screwdriver and be gentle with the components. If you've ever installed a stick of RAM you can handle it. There's a PDF on the bottom of the product page with instructions. I know there are better routers, there are cheaper routers, I'm not sure if there are other routers this small. But one thing I do know is that if you are a Mac user it will be portable and very convenient to use (it also works with PCs, I've never tried it, but I'm not going to claim doing anything on a PC is as easy to use). Especially if you already use a regular Airport (or Time Capsule) for your home or work network, it's a natural choice when you want to add an additional router, or have a portable one to take with you to work or on the road. The unique innovation that came with the original Express was the Airtunes feature. The router has an audio jack at the bottom. Here's how I used it when it first came out: I had my regular Airport near my computer, and my Airport Express plugged into an outlet in my kitchen, which was next to the bathroom. From it I ran a 6-foot stereo mini-plug audio cable (bought cheaply at Radio Shack) over my fridge and into the bathroom, where it went into some cheap speakers. In the morning I would select a playlist on my computer and select the "Bathroom" location from iTunes, and it would play my music as I was getting ready for my day. The only reason I had the router in the kitchen was to keep it away from the excessive moisture from the shower. That was something silly I did just because I could -- I really bought it so that I could bring a router with me easily in my backpack wherever I go, so that I could create a wireless network in a rehearsal room, for example. If you're in a home environment where one router just doesn't cut it, you could also use it to extend your home network when you're at home, and then stick it in your bag (or pocket, even!) when you need to take a router with you. It's small. I can't quite describe what it's the size of -- it's a little bigger than a deck of cards. It also uses the standard Apple power connector, so you can swap in international connectors, or use your power cord extension from your laptop if you need some length instead of just sticking it in the wall outlet. I should mention that I bought the first Airport Express when it came out, so mine is quite old. I'm not thrilled with the stability of it -- sometimes it needs to be rebooted -- and the range is understandably not as good as the full-size Airports, but I can't speak to the quality of ones manufactured later, or the brand-new version that supports the wireless n standard that came out recently. I'm sure they must offer some improvement.